This album is one you simply must add to your playlist. My journey with Casting Crowns began few years back, 2012 to be precise. When a friend from church told me she had a song l would enjoy. When l listened to “Voice of Truth” Voilà, was l hooked! 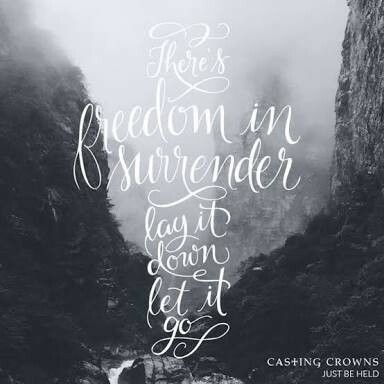 This particular song, “Just be Held” speaks to your heart and depicts a special hope. Its lyrics fits like a glove the “Footprints in the Sand” poem. Truly when we look @ the storms we experience, all we think is; is God still there? Does He see the pain l feel? Does He even hear my cry? But when we remove our eyes from the storm and focus on Christ. On His Love, compassion, amazing wonders and majestic splendour. We realise that He has been with us all the way. Guiding, healing and strengthening us in ways we couldn’t see. This song displays an image of the scripture ”Cast your cares upon Jesus”. (Paraphrased Psalm 55:22) It’s not just the big troubling burdens we are called to lay on the feet of the Master, but also the little worries we feel we don’t need to bother God about. Go to Amazon and quickly add this album to your playlist! Would like to hear from you. What song speaks to your heart in a special way? Send in your comments below!